On Monday, 21st November 2016, a baby elephant estimated to be about 4 months old was brought to HESC. 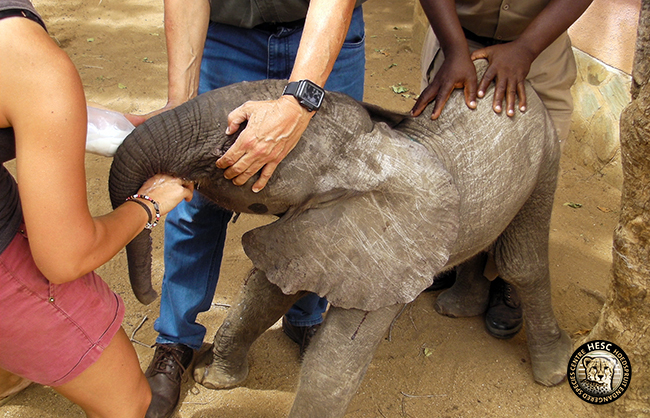 The young elephant was found wandering on his own on the reserve next to the R40 tarred road. People had started to pull off in order to watch the little elephant and he was very distressed. Erich Ferreira from Kapama called to notify us that Dr Rogers was coming out to dart the baby elephant at 6pm that evening. 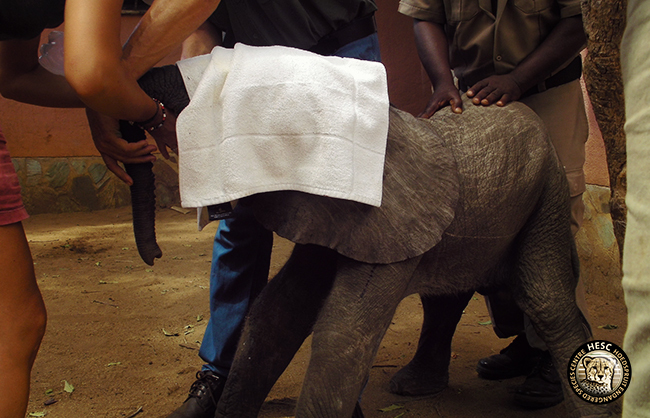 The elephant arrived at HESC just after 8pm and Dr Rogers gave him an intravenous drip as he was dehydrated. On his first night he didn’t sleep at all. 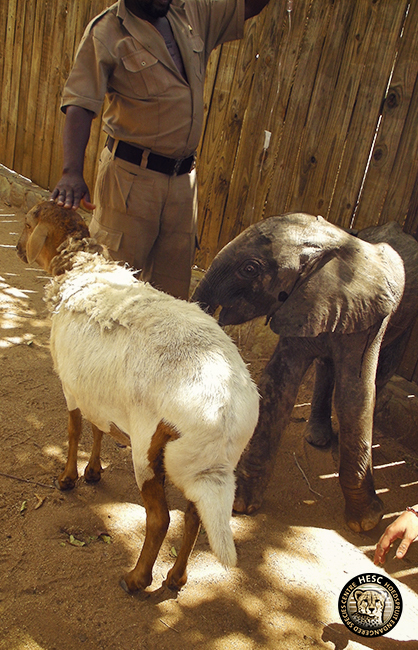 Lammie was fetched and introduced to the baby and this seemed to help calm the little one down a bit. 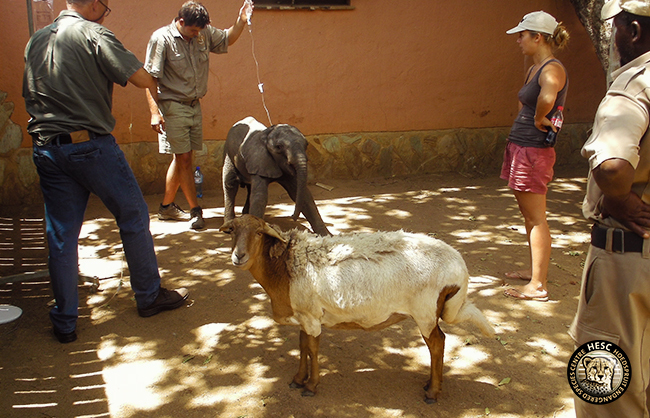 The little elephant was trying to get use to the new environment and work through the sedation effects. Dr Rogers had sedated the elephant using BAM, which worked amazingly. 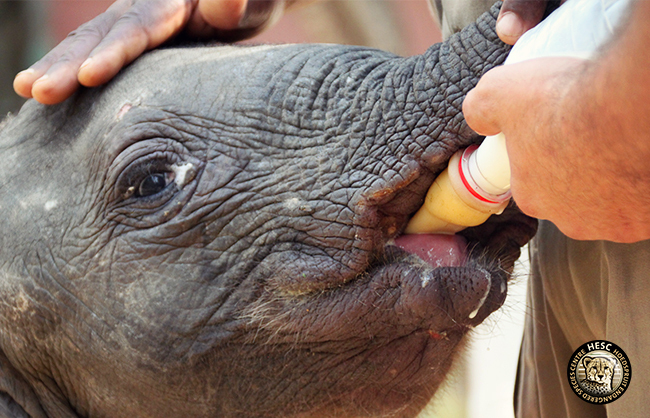 On day two, the little elephant was still not taking the bottle. Dr Rogers came in and administered 3 litres of saline drip (a solution of sodium chloride/ table salt in water) yesterday afternoon. Because he wasn’t taking the bottle he was quite thirsty, but luckily he did go to the water trough to drink some water. He spent his time napping, when not following Lammie around. To make him feel more comfortable, we brought some dung over from the elephant herd at Camp Jabulani. He played with it and picked it up, and one could tell this was something he’s familiar with. We also hung some branches upside down in his boma, which he and Lammie investigated and nibbled on – although Lammie did do most of the eating. Early this morning, he luckily started taking the bottle and has been drinking strongly following a good night’s rest. For every input, there’s an output – which we are eagerly anticipating as this will be a good indicator of his health. We weighed the baby this morning (Wednesday 23rd November), and he clocked 101kg. 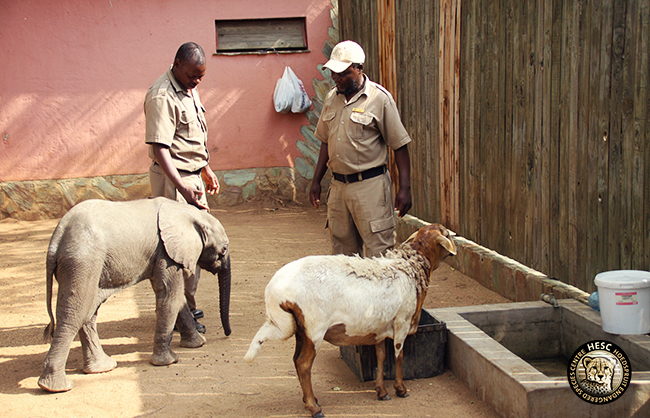 Keeping the young elephant company on a 24/7 basis is Joshua and Israel (elephant grooms from Camp Jabulani) and of course Lammie – all of whom he follows around. At the moment Joshua is doing night shifts and Israel day shifts. You guys do such good work! Well done! Hope baby ellie gets stronger every day!! So thankful for team HESC & incomparable mama lammie. Hoping this precious baby gains strength. Poor little baby. I hope he will survive with all help care and love given from HESC team and Lammie. 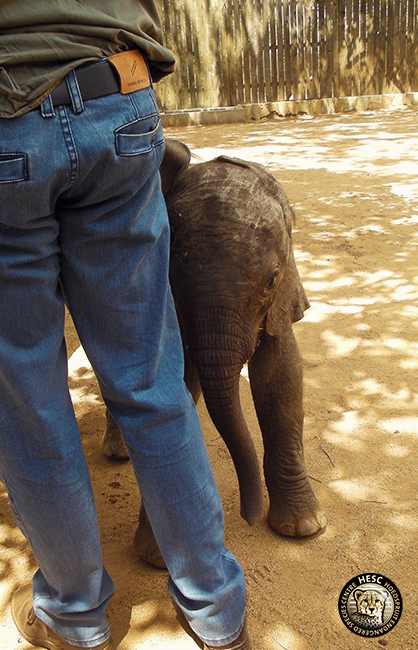 A team of heroes from Lammie to the humans will safe this little baby and give him a new, safe, loving home. 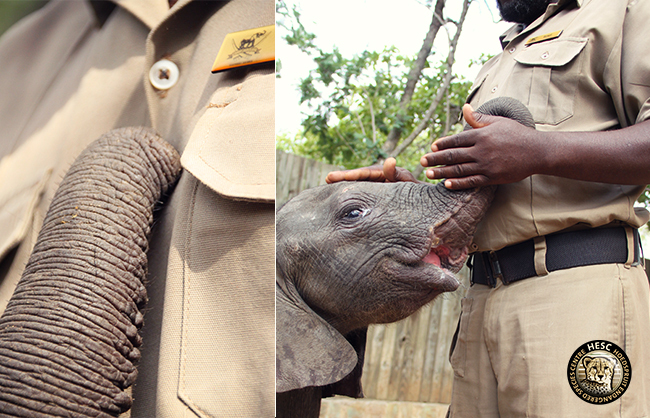 It is all our hopes that he thrives under your excellent care and Lammie’s expert mothering. Well done ! The fight continues and today is a victory for the elly and HESC. She is fantastic to all who are put her way to mother to.